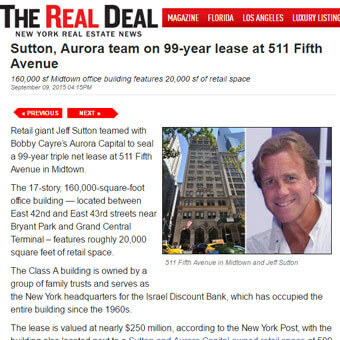 Retail giant Jeff Sutton teamed with Bobby Cayre’s Aurora Capital to seal a 99-year triple net lease at 511 Fifth Avenue in Midtown. The 17-story, 160,000-square-foot office building — located between East 42nd and East 43rd streets near Bryant Park and Grand Central Terminal – features roughly 20,000 square feet of retail space. The Class A building is owned by a group of family trusts and serves as the New York headquarters for the Israel Discount Bank, which has occupied the entire building since the 1960s. The lease is valued at nearly $250 million, according to the New York Post, with the building also located next to a Sutton and Aurora Capital-owned retail space at 509 Fifth Avenue, currently occupied by Skechers. Cushman & Wakefield brokered the transaction on behalf of the building’s owners, with Sutton and Aurora expected to undertake renovations at 511 Fifth Avenue and assume responsibility for leasing. The property is located one block from a development site at 520 Fifth Avenue, which Joseph Sitt’s Thor Equities recently sold to Ceruzzi Properties and Shanghai’s SMI USA for $275 million. The buyers are planning a condo project on the site with a total projected sellout of $1 billion, The Real Deal reported last month.